The upper eyelid crease in Asians makes the eyes appear larger and the person more friendly and approachable Our personality and attitudes are expressed through our eyes. The upper eyelids have a profound impact on the appearance of the eyes. It determines if you look young and fresh or tired or even fierce. A well-placed and crisp upper eyelid crease frames the eyes, focusing the observer on the eyes and, in so doing, brings the sparkle out of the eyes. An absent upper eyelid crease (that occurs congenitally or as a result of hooding that occurs with aging), in contrast, shifts the focus of the observer to the upper eyelid, giving the visual impression that the eyes are smaller and the upper eyelids as overhanging the eyes. This makes the person appears reclusive, listless and distant. Upper eyelid surgery is for 2 groups of patients: For patients with an absent or poorly formed upper eyelid fold and for patients with significant aging of the upper eyelids. Setting the upper eyelid crease too high looks unnatural on the Asian eyes. Excessive skin and fat excision inherent with the technique results in sunken eyes and upper eyelid hollowing (above). With aging, the skeleton becomes visible giving an emanciated appearance An absent upper eyelid crease or fold is commonly seen in ASIAN eyes. Upper eyelid crease creation or ‘Double eyelid’ surgery as it is commonly called, is a procedure designed to produce a crease in the upper eyelid. Upper eyelid fold creation has the profound optical illusion of making the eyes appear larger and brighter. The person appears more approachable and friendly as a result. The creation of the upper eyelid crease has evolved tremendously over the past few years, with advanced appreciation of the unique anatomy of the Asian upper eyelids as well as the changing taste that now focuses on beautification of the ASIAN features (and not westernization of the Asian eyes which was popular in the past). The older techniques of upper eyelid creation focus on creation of high upper eyelid crease, removal of upper eyelid fats that hollow out the Asian upper lids and excessive skin excision. Called ‘westernization’ of the Asian eyes, this approach is now considered obsolete in modern Asian upper eyelid surgery. The modern Asian double eyelid surgery focuses on creation of natural and harmonious double eyelids suited for the Asian face. Skin excision is done conservatively, the upper eyelid fold made crisp and well defined and the precious upper eyelid fat preserved as appropriate. This gives a natural upper eyelid crease, with no tell signs that surgery was performed on the upper eyelids. As noted, a well-performed double eyelid procedure will focus the attention of the observer to the eyes, bringing the sparkle back to the eyes. With this in mind, upper eyelid crease creation can be done by 2 methods in Asians. 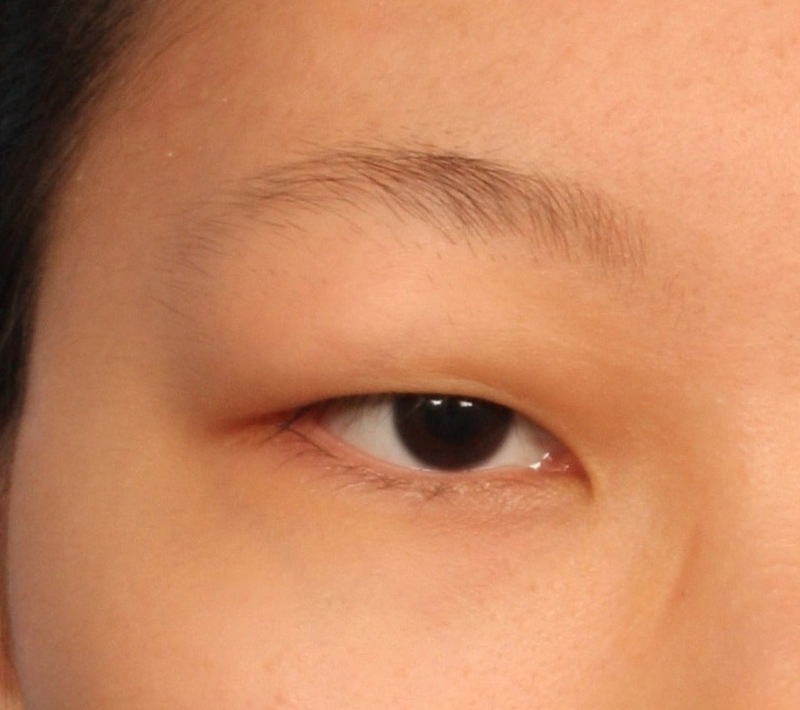 An Asian patient with an absent upper eyelid crease with no excessive upper eyelid fat or puffiness Also called the scarless upper eyelid creation, this technique involves precise placement of several key sutures into the upper eyelid to create a crisp fold in the upper eyelid. Technique and precision is important in executing this procedure. The sutures need to have sufficient holding power to form a crisp crease in a symmetrical position. The technique is versatile in that the height and shape of the fold can be precisely controlled by changing the placement of the sutures. Minor asymmetries of the upper eyelid, when present, can also corrected by placing the sutures in slightly differential positions in each upper eyelids. As the procedure does not involve cutting, down time is minimal and patients can return to work and resume their usual activities after a few days. This technique is suitable for patients without an upper eyelid crease but with no excess fat or puffiness. This method, also called the upper eyelid blepharoplasty, involves the conservative excision of excess skin. The advantage of the incision method is that it offers tremendous versatility by allowing creation of precise upper eyelid crease and removal of true excess fat (to reduce the puffy upper eyelids that some patients complained of) when these are present. By fixing the skin directly to the upper lid structures below it, a very robust and sculpted upper eyelid crease can be reliably and predictably created, giving a crisp and well formed upper eyelid fold. Because of the versatility afforded by the incision technique, the fold can be exactly created to the suit each patient’s needs. Lost of fold is very rare with the incision technique. Patients with puffy upper eyelids and a true excess of upper eyelid fats would benefit from the incision technique as it allows for precise removal of upper eyelid skin excess, muscle as well as orbital fat Incision upper blepharoplasty is recommended for younger patients who are seeking to create natural and crisp upper eyelid crease to brighten the eyes. The incision technique has the advantage of allowing for more predictable correction of minor asymmetries of the upper eyelid, removal of true excess upper eyelid fat as well as for the formation of a permanent upper eyelid crease with minimal chance of loosing the fold. The versatility afforded by the incision technique is that the amount of skin and muscle that is excised can be precisely controlled in designing the procedure and that the shape and contour of the fold that best suit the patient can be designed with the patient’s input. As this technique involves small cuts of the upper eyelids, swelling is a little more compared with the suture technique, lasting about 1 – 2 weeks. The delicate upper eyelids tissues are prone to age related changes (which can appear at quite an early age). The intensity that radiates from the youthful eyes is gradually lost with aging. The eyes now appear dull and tired. This in large part is a direct visual impression resulting from aging of the upper eyelids. The excess and creepy skin of the upper eyelid results in the upper lids appearing heavy and droopy. Also the upper lid itself starts to droop, this result in a decrease in the distance between the upper and lower eyelids, and the eyes appearing smaller. Drooping of the upper eyelids, called ptosis (latin: to fall) is a very significant component of the aging evelids caused by loosening of the complex and delicate mechanism that opens the eyes. This is a very important aspect of the aging upper eyelids that needs to be diagnosed preoperatively and managed with specific surgical correction during the surgery. 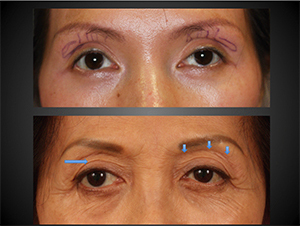 Accordingly, the incision upper eyelid blepharoplasty for the aging eyes comprises 2 components. Firstly, conservative excision of excess skin, muscle and fat to remove the excess tissues, lift and rejuvenate the upper eyelids and then securely and precisely fix the upper eyelid crease to the underlying tissues. 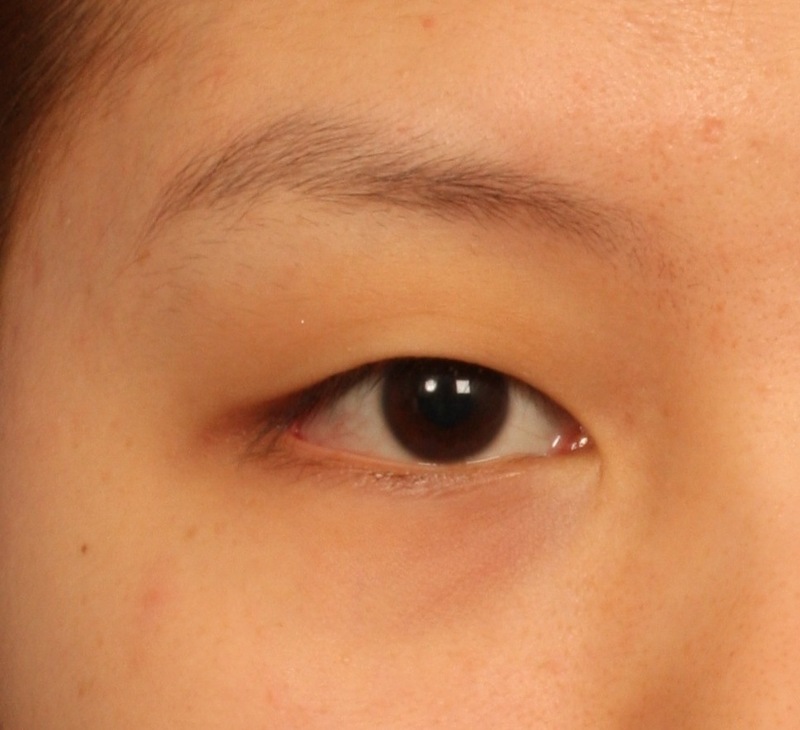 Secondly, in a proportion of patients with ptosis, ptosis correction is mandated, otherwise the upper eyelid would remain droopy after the surgery, resulting in a suboptimal outcome. This is done with a procedure called levator advancement where the mechanisms that open the eyes that has come loose with aging is tighten, to widen the eyes. This will bring the sparkle back to the eyes and is the hallmark of quality upper eyelid surgery.